Free Shipping Included! Biotics Research DL-Phenylalanine – Mental Acuity, Emotional Well-Being, Cognitive Function, Neurotransmitters, Essential Amino Acid, Positive Mood 600mg/capsule, 100 caps by BIOTICS at Mental Health TN. MPN: 5221. Hurry! Limited time offer. Offer valid only while supplies last. PROMOTES A POSITIVE MOOD: DL-Phenylalanine is an amino acid that is converted in the liver to L-tyrosine and helps to produce dopamine and epinephrine, neurotransmitters that improve mood. SUPPORT COGNITIVE FUNCTION: Phenylalanine plays a significant role in the production of proteins and neurotransmitters, thereby supporting mental alertness and cognitive function. 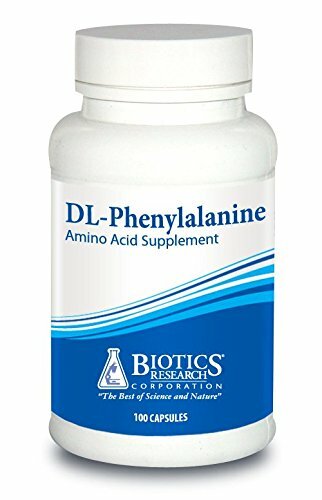 ESSENTIAL AMINO ACID: L-Phenylalanine is an essential amino acid that is easily converted into tyrosine, which plays a role in synthesizing proteins and producing neurotransmitters. WHO WE ARE: Biotics Research was the first company to introduce a natural form of CoQ10 as a dietary supplement into the US market in 1979. We have revolutionized the nutritional supplement industry by utilizing "The Best of Science and Nature". We drive advancement by focusing our initiatives on research, natural effectiveness, product safety, efficacy, unparalleled quality control and continuing innovation. QUALITY MADE IN THE USA: We produce tablets, capsules, powders and liquids in our Rosenberg, Texas, FDA-Registered, Texas Department of Health licensed, GMP-certified production and laboratory facility. Our products are tested in our state-of-the-art laboratory to ensure their safety, efficacy, and purity, and DL-Phenylalanine, like all Biotics Research products, is Gluten Free! If you have any questions about this product by BIOTICS, contact us by completing and submitting the form below. If you are looking for a specif part number, please include it with your message.